Young people! If you have never attended the youth conference at Macedonia Missionary Baptist Church, you should make plans to attend in a few more weeks, July 19-24. It’s an action packed good time – with young people from throughout the state and country attending, hearing the word of God tailor made for them and praising God with national gospel artists, youth preachers and poets, along with a service project and basketball tournament (and more). This year’s youth conference, a.k.a. 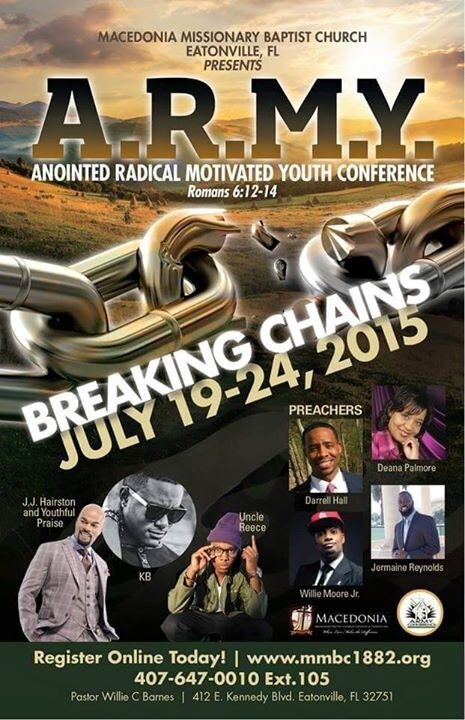 the Anointed Radical Motivated Youth (A.R.M.Y.) Conference, is themed “Breaking Chains” and will feature J.J. Hairston and Youth Praise, KB, Uncle Reece, Darrell Hall, Willie Moore Jr., Deana Palmore and Jermaine Reynolds. And of course, the church’s youth choir will do its annual concert on Wednesday, July 22 at 7 p.m.
Register now online at http://www.mmbc1882.org or call the church office, (407) 647-0010, ext. 105. The church is located at 412 E. Kennedy Blvd., Eatonville, FL 32751.